I had known for a long time that I wanted a fitness tracker. My father had a clip-on version and he was always showing me how many steps he had taken during any given day. I had developed step tracking-envy and wanted to know how many steps I was taking as well. So, for my birthday I asked my husband if he would get me a fitness tracker. He agreed but wanted to know what kind I wanted. At the time, I didn't realize that there were so many different kinds to choose from, so I decided to do some serious research. After viewing many review sites and checking out all of the available types on Amazon, I decided that I wanted a Garmin Vivofit 1. At the time, the Vivofit 2 was already on the market, but it was more expensive and didn't really do very much more than the Vivofit 1 for me to justify the extra cost. 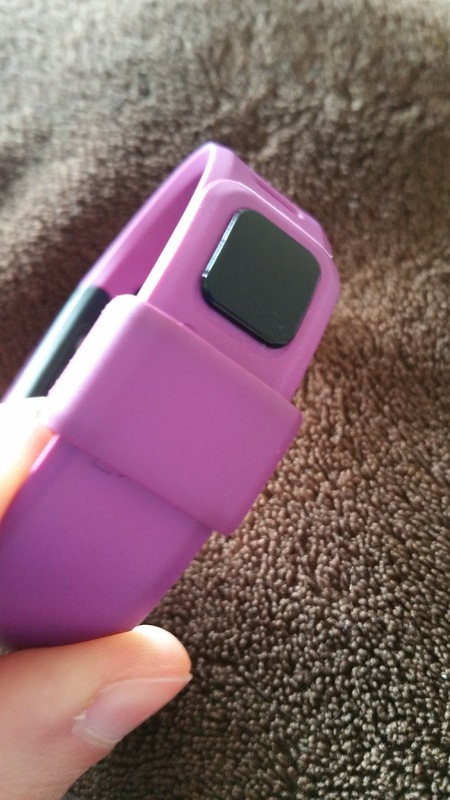 I wanted to try out my Vivofit activity tracker for several months before I wrote a review about it. I have been using it consistently for about 4 months now. I only take it off to shower or to go swimming. Garmin does state that the Vivofit is water resistant, but I don't want to take any chances of damaging it. - It counts how many steps you take in a day and resets automatically at midnight. - It tracks how many miles you have walked in a day. - It tracks how many calories you have burned in a day. - It tells the date and time. - It automatically knows when you go to sleep and wake up based on your movements. There is no need to press buttons to enter sleep mode. - It sets an attainable goal of how many steps you should do in a day based on your previous days' steps. - It is water resistant. - It never needs to be recharged. It uses replaceable batteries that last a whole year! - When you take it off or stay particularly still for a period of time, the screen goes blank to save battery power but comes right back on again with the smallest movement. - It comes with 2 sizes of bands, a small and a large. - It has the ability to track your heart rate with a chest band that you can purchase separately. - Garmin has a free Vivofit app for Android that you can sync to wirelessly via Bluetooth to upload and save all of your data. - It's fairly light weight and this was important to me because I have very small wrists. - It tracks steps very accurately. I have counted my steps in my head numerous times while wearing my Vivofit, and the numbers always match up. - I like that it has a clock, which eliminates my need to wear a watch or pull out my cell phone to check on the time. - The wristband is super comfortable. I wear it for 23.5 hours every day and it never annoys me. - I have not had an allergic reaction to the band. - The band closes securely and it has never fallen off of my wrist or come apart. - It can display how many steps I have taken whenever I want to see it. 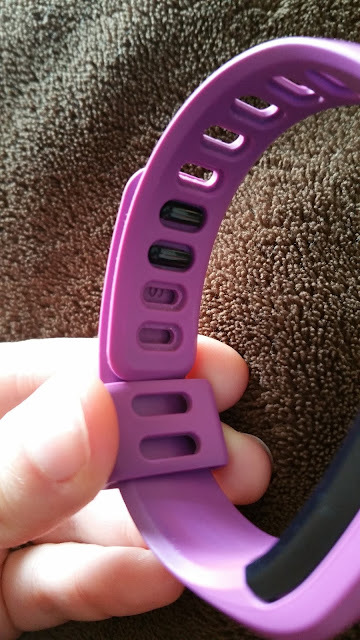 There are some other activity trackers that you cannot see this information just by looking at the display on the band, and I don't like that at all. I don't want to pull out my smartphone every time I want to see how many steps I have walked. - The sleep tracking ability is awesome and very accurate. It tells me how long I slept, and which portion of that was light sleep and which portion was deep sleep. It also tracks when I wake up and walk around during the night. - It uses a red bar to tell me when I have been inactive for an appropriate amount of time to encourage me to get up and walk around. - It has a step countdown feature that tells me how many steps I am away from meeting my daily goal. I usually try to make up these steps before I go to bed at night so that I can reach my goal. - It NEVER needs to be charged. This was one of the main selling factors for me. I hate things that need recharging, they always seem to be dead whenever I want to use them or they die while I'm using them. This fitness tracker just uses small batteries that last for a WHOLE YEAR! - The price is good too. I am a very frugal person and I found the Vivofit to be priced very competitively, coming in less expensive than other bands that offered similar experiences. - It just has one physical button that you use to navigate through the different screens. So it's very user-friendly and not complicated to use. It also doesn't have a touchscreen, which is great in my opinion. - I wish that the display was the same way as a normal watch, instead of going across the wrist. I believe they have solved this issue with the new Garmin Vivofit 3, but I'm not sure if it does anything else much more than mine, so I can't justify the additional cost for that reason alone. - It is a bit clunky looking on my small wrist. You can definitely tell that I'm wearing an activity tracker. The face is also a bit too long for the width across my wrist. - The first few times you wear it, the band is quite difficult to put on. But once you wear it for a while it becomes more supple, making it much easier. If you are having trouble inserting the pegs into the holes, rub a tiny amount of hand lotion on the holes, this makes it much easier! Closing mechanism on the band. - After wearing it for 4 months, the band has become a little bit discolored along the edges, likely from rubbing against things like my dark blue jeans. My band is purple. If I had chosen the black band, this likely would not be an issue. - It does not count how many stairs I have climbed in a day. If I could add one single more feature to this band to make it perfect, this would be it. - It doesn't differentiate between different activities like walking, running, or dancing. This isn't really a huge deal, and definitely not a deal breaker for me, but it would be a neat feature. - It doesn't have a back light, so you can't really check the time during the night. So, now that I have given my honest review of the Garmin Vivofit 1, I must say that the pros definitely outweigh the cons. I was just being very critical so that you, the consumer can make the best-educated decision about which band is right for you. 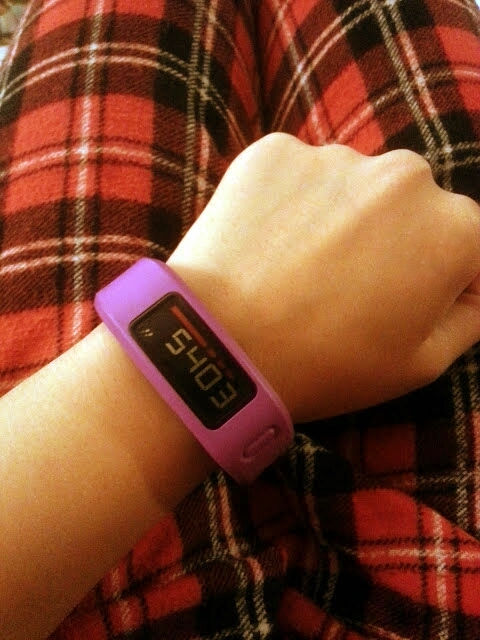 I absolutely adore my Garmin Vivofit. I couldn't ask for a better fitness tracker. I hope Garmin continues to make them and sticks with models that have long battery lives don't require charging. Now, here you are, at the bottom of my review. Thank you for reading it all. I hope it helps you make the decision of which activity tracker is right for you. Do you use a fitness tracker? What kind are you using right now? 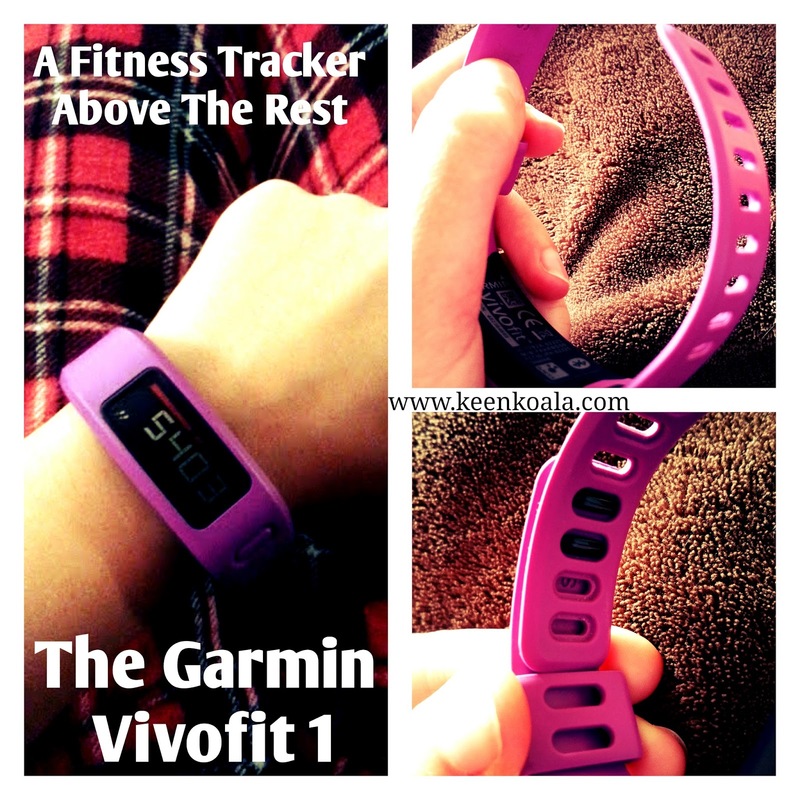 Or do you have some more questions about the Garmin Vivofit? If so, let me know in the comments section below, I would love to hear from you. For more great articles and instant access to exclusive content, contests, and more, please 'Like' Keen Koala on Facebook by clicking HERE!